The Koie fish or climbing perch is a tasty fish found in South and East Asia. And Tel-Koie is a rich curry cooked with Koie fish in generous amount of Mustard oil. It is considered a delicacy in the Bengal region. And finally the fish is added to the spices and cooked to completion. 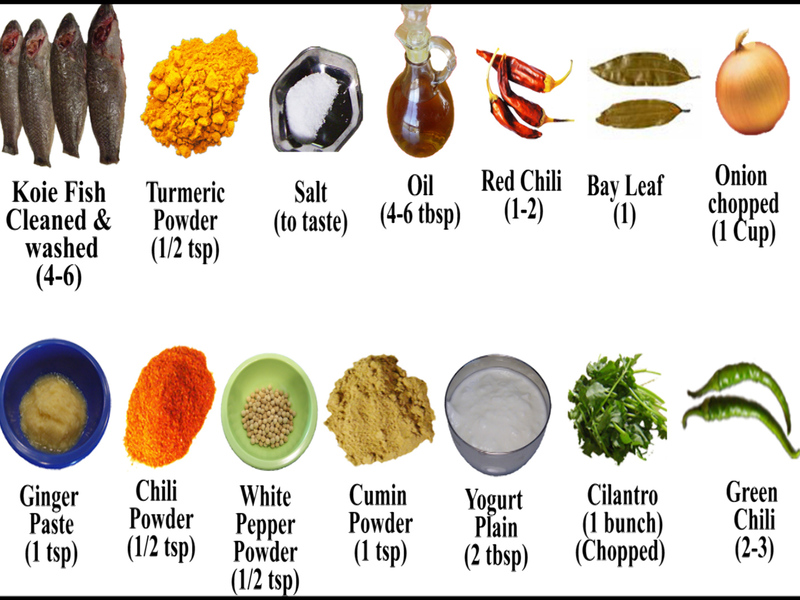 To marinate the cleaned and washed fish, add salt and turmeric powder. Then rub the fish with it. Leave it aside for about 10 minutes. To a moderately hot wok, add mustard oil. When the oil is hot, add the fish. Fry one side for about 2-3 minutes and occasionally lift the fish with a spatula to check if the underside is frying well. Then turn over the fish and fry the other side as well. You may have to repeat the process a few times to complete the frying. The remove the fish from the heat and set it aside to be used later. In the same wok, add some more oil and when it is hot, add a dry red chili and a bay leaf. Stir for a minute. Then add chopped onion, and stir it for about 8 – 10 minutes or the onion becomes translucent. Add evenly stirred yogurt in 1 tsp batches and stirring after each addition. That way the yogurt would not curdle. Bring to a boil. Add the fried fish and mix and then cover. Cook for a minute or two and then uncover and turn over the fish pieces. The Tel-Koie is cooked with very little gravy. So bring to the consistency of your choice. Sprinkle the chopped cilantro and garnish with the sliced green chilies. If you are not overly concerned about oil, you may want to add some raw mustard oil at this point. And this completes the Tel-Koie cooking. It takes about 45-50 minutes to cook and serves 2 people. It is best served with hot steamed rice.